The new Woodmere Pulldown Kitchen and Preparatory Faucets have a distinctive design that creates an uncluttered oasis on your countertop. The kitchen faucet also features our exclusive patented pause button, so you can easily suspend the water flow from the wand. Where we consider every nuance, from distinctive styling to impeccable performance, to ensure each of our faucets and accessories is designed to be uncommonly exquisite. A unique balance of grace and precision combined with a dash of the unexpected. That’s what you’ll find with ShowHouse®. eFaucets.com is the leading online retailer of Faucets. 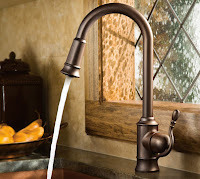 We carry every Showhouse by Moen product including Showhouse Faucets, Moen Faucets, and Moen Sinks. Free Ground Shipping on all orders over $99. Award winning site, large selection, low prices and excellent customer service. The Faucet leader. Why shop elsewhere?